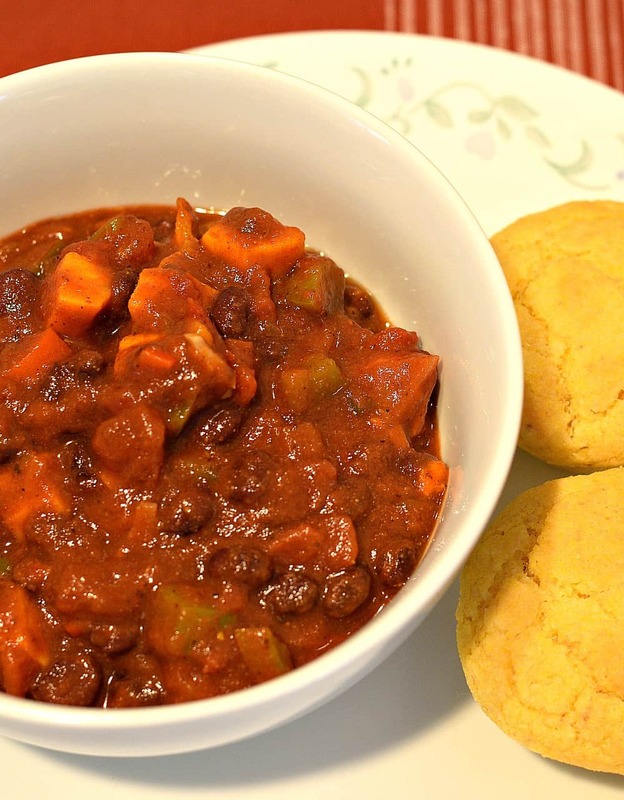 Yesterday was a cold and snowy day in the Pacific Northwest …..perfect for making this big yummy pot of …..
Sweet Potato & Black Bean Chili! 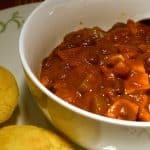 I absolutely love chili – but have always been used to traditional Texas Style (bean/tomato sauce) chili with lots of spice. 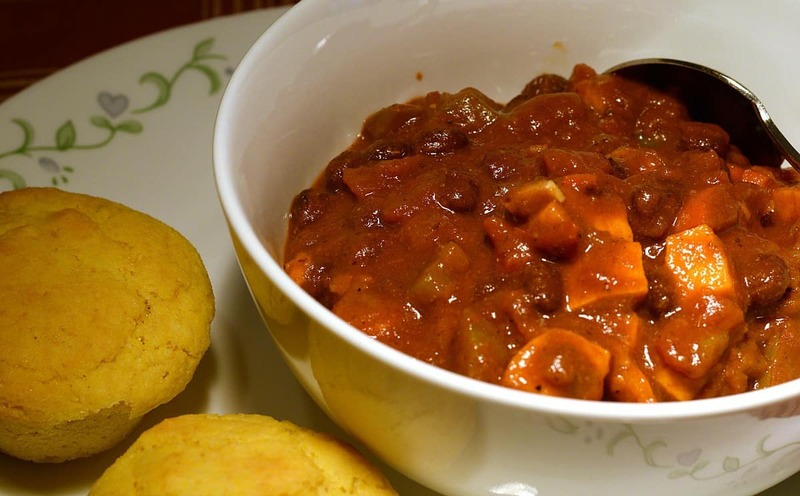 This version is a little different in that it uses Black Beans AND Sweet Potatoes making it super healthy – chock full of vitamins, antioxidants, and our all important fiber. And when served with my Sweet Cornbread Muffins? 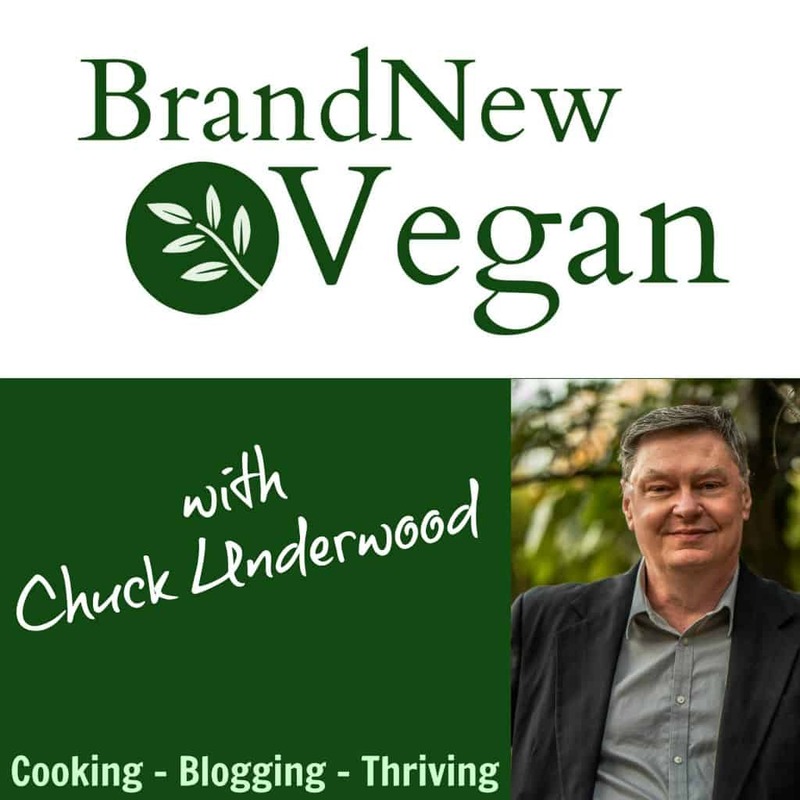 Speaking of breaking the bank….. Cauliflower – sheesh! What’s up with the price of Cauliflower anyways?! I’m sure this will be in my lunches for the next few days – providing this wintry mix of snow and ice allows me to get back to work! 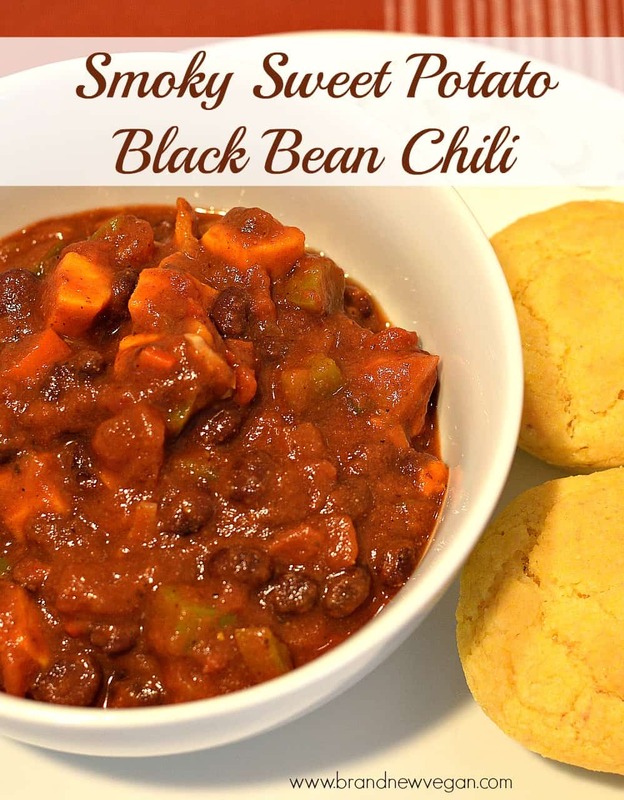 In the meantime – I think I’ll enjoy my snow day and eat some of this yummy Black Bean Chili. This is a very simple one pot recipe to make. Simply saute a small onion with a couple of Sweet Bell Peppers (red & green) and Garlic until softened. Then add a little 4oz can of diced Green Chile and 2 chopped Chipotle Peppers (with their Adobo Sauce). The Chipotles add an amazing smoky flavor but can be left out if you want. Now simply add the rest of the ingredients and simmer for an hour or so, stirring occasionally. I do like to use Masa Flour as a thickener towards the end of the boil. I like the slight corn/tamale flavor it adds and it does a great job of thickening up the stew, but it can be left out if you want. This Smoky Black Bean Chili is super healthy - chock full of vitamins, antioxidants, and our all important fiber. Great Snow Day Food!